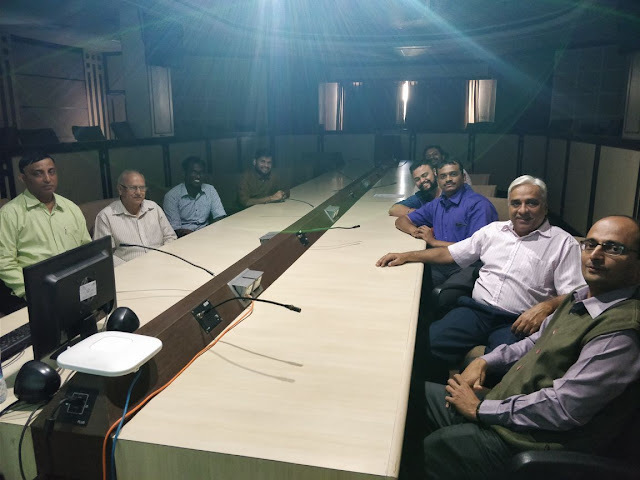 The visit, hosted by the IITM under the guidance of Prof Dr Milind Mujumdarji, Scientist E.
It was indeed very warm welcome and helpful approach of IITM professional weather scientists interacting with Vagaries' amateur meteorologists. Seven of us from Vagaries, Rajesh , Abhijit, Abhishek, Vineet, Shreyas, Gokul & Rajdeepak were studying and visiting IITM. ( Vineet, Shreyas, Gokul & Rajdeepak are already affiliated students with IITM who have decided to take their weather hobby into professional studies. We first went to the office of Dr Milind Mujumdarji,Scientist E where another scientist Mr Sunil Ghanekarji, Scientist D also welcome us. Their vast knowledge on climate modeling & Indian summer Monsoon dynamics was captivating and had us all listening. Ghanekerji has immense knowledge on weather charts of different wind levels. Drawing exact trough, low position is his specialization, as he explained to us the actual interpretation of a trough or Low is very important, and can alter a situation if interpretation is analysed differently.. Inter-acting with both was very informative. Both of them patiently explained and answered all our queries related to forecasting. 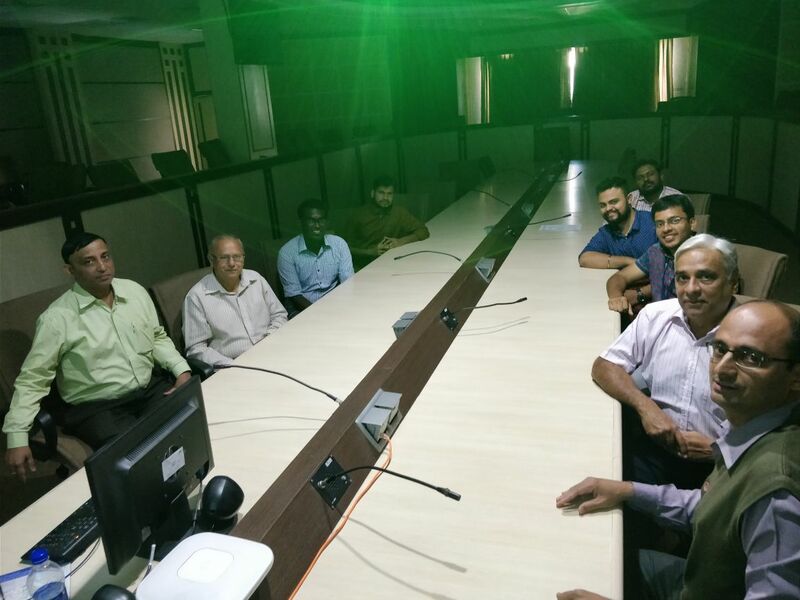 After an hour of interesting session with Dr.Milindji & Ghanekarji, we were taken to the conference hall, where presentation on various topics like SAFAR, MME forecasting model in general with special reference to Monsoon meteorology and Air Ocean interaction with Indian subcontinent monsoon. Firstly M/S Aishwarya, gave presentation on System of Air Quality and Weather Forecasting and Research" known as "SAFAR" which has been setup, for the first time in India, at greater metropolitan cities of India to provide location specific information on air quality in near real time and its forecast 1-3 days in advance . It (Forecast) has been combined with the early warning system on weather parameters. And main objective of the project is to increase awareness among general public regarding the air quality in their city well in advance so that appropriate mitigation measures and systematic action can be taken up for betterment of air quality and related health issues. Then Dr Anant Parekh Ji Scientist D, explained how weather forecast models works and how important initial feeding parameters at T-0 helps in achieving accurate prediction and at T-0, if we have more errors then further expading and progressive errors go on expanding ! So for understanding proper initial conditions how data assimilating needs to be accurate . Dr. also enlightened us with his immense knowledge on Satellite Oceanography & Ocean Atmosphere and how it plays an important role in diagnosing the rainfall & temperature patterns across the globe . Then Mr. Somanth Mahapatra Ji Scientist E, explained how IITM does MME forecast using the state-of-the-art Climate Forecast System Model Version 2 (CFSv2). Also introduced and explained the Monsoon Mission project management in which how for the past 5 yrs Indian Southwest monsoon forecast probability was achieved correctly in All India estimation category .He enlightened us on Numerical weather prediction (NWP) using regional and Meso-scale models & Seasonal and extended range prediction of monsoon which are useful in knowing wet & dry phases in monsoon so that respected body can be aware of. All this presentation went with live interaction, as queries from us were answered patiently. Later lunch arrangements was made for us in the IITM canteen. We had great lunch break time too. So we are really thankful for it. After lunch we were taken to field visit, where we saw Cosmic Ray soil moisture monitoring system(COSMOS), is an latest soil moisture detecting instruments which are specially ordered from Germany, and currently testing and research is carried out so in future it can be implemented to achieve accuracy in given diameter of farming area. This is the field-scale soil moisture measurement technique. Soil moisture variations are very important, and it is necessary to predict a "water run off" or "Water soaking" capacity of the soil. Important for farm sustenance. And all it's technical configuration & working physics was very well explained by Mr. Mangesh Goswami, project scientist for COSMOS, who joined us for this field visit. Also Mr. Naresh Ganeshi an PhD student & Shreyas' batch-mate, Kunal, joined us for further all lab visits. ( interacting with upcoming weather scientist). Also we were shown SAFAR instruments which measures the air pollution and it's display which were reflecting live parameters like PM10, PM2.5, C0,NO2,O3. Later we were guided to various scientific research labs of IITM like Isotope stable Mass Spectrometer Lab, Paleoclimatology Lab, Lightning Monitoring Lab and Tree-Ring Chronology ( Dendrology)Lab. At each Labs the scientists guided us and explained their respective ongoing research. 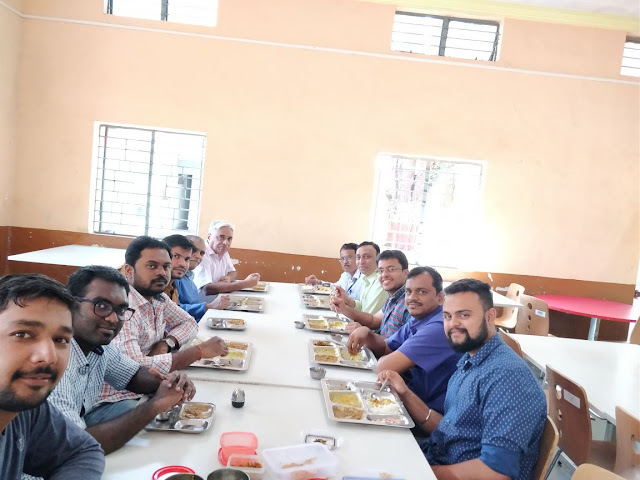 We are thankful to the arrangement and hospitality shown by all the IITM officials we met, answering our queries in details and explaining everything with patience. Truly IITM is a pillar of Meteorology and Allied fields in India. Thanks Abhijit for this very interesting post. Am really glad that the Vagaries team under the guidance of Rajesh is taking so much interest in understanding the nuances of a complex topic like weather. We readers of this blog are fortunate to be enlightened even more on weather by your team. Lots of technicalities to understand but a delight to read , Keep going, Vagaries ! Great info of IITM visit .. The La Niña in the Pacific Ocean continues to decline. Sea surface temperatures in the central tropical Pacific have warmed steadily since late December, with most models forecasting La Niña will end early in the southern hemisphere autumn. El Niño–Southern Oscillation (ENSO) indicators continue to show at least some La Niña characteristics. Sea surface temperatures indicate a weak La Niña pattern, with the coolest waters concentrated in the eastern Pacific Ocean, while the Southern Oscillation Index is neutral, but weakly positive. However, a very strong pulse of the Madden–Julian Oscillation (MJO), which drove a burst of monsoonal activity over northern Australia in late January, has caused the western Pacific trade winds to weaken considerably. The rapid weakening of the trade winds may hasten the decline of La Niña. The MJO also led to above-average cloudiness at the Date Line for the first time since early September 2017. In order for 2017–18 to be classed as a La Niña year, thresholds need to be exceeded for at least three months. Four of the eight climate models surveyed by the Bureau suggest this event is likely to last at least until late summer, while a few continue the event into the southern hemisphere autumn of 2018. Typically, the strength of a La Niña event reflects the strength of its impact upon Australian climate. The current event is weak, and hence climate patterns have been significantly different from those observed in the last strong La Nina of 2010–12. Large parts of eastern Australia have been drier than average for the past two or three months, the opposite of what is typically expected during La Niña. Maharashtra land of dynamics ! NAVI MUMBAI cleanest and greenest city of India - maximum dense trees! Highest largest Mangrove forest cover! Largest number trees in India! Highest/wettest South west monsoon for last 2-3 years! Time for other states like KAR,KER,TN and others learn from Mumbai/Navi Mumbai/Thane smart cities - infrastructure co-exist with nature!